This is the first post in a small series describing my favorite data mining feature in SQL Server 2008, model filtering. Filtering allows you to take full advantage of the mining structure / mining model dichotomy, separating the data staging (in the structure) from the modeling (in the mining model). SQL Server 2008 allows specifying, for each mining model, a filter to be applied on the training data. The filter acts as a partitioning mechanism inside the mining structure and it is applied on top of any training/testing partitioning already existing at the structure level. Furthermore, filters can be applied to data in nested tables, but more about this in the next post. Filters allow you to build different models for various partitions of the data with minimal effort, either to obtain better overall accuracy (think of it as manually specifying the first split in a decision tree), or to compare the patterns between different partitions. So, let’s start with a simple scenario, using the same old Adventure Works data - building a mining model that predicts how likely a customer is to purchase a bike based on various demographic information. Let’s also assume that you know, based on your experience with the data that the Geography factor has in important role and you don’t want your North American patterns to hide (because of volume) the peculiarities of the Pacific market. In a previous post I presented some of the new DMX features in the November CTP of SQL Server 2008. So, here are some new cool DMX tricks. Assume you want to use Microsoft Association Rules and Microsoft Decision Trees on the same data. Also, assume that the data contains one numeric column (say, Age). You may have noticed that Decision Trees supports continuous columns, while Association Rules does not. Not a big deal, we have discretization, and Age can be added twice to the same mining structure as, say Age (Continuous) and Age Disc (Discretized). However, the two different names raise a problem in the case of NATURAL PREDICTION JOIN (where input columns are bound by name to the model columns). In SQL Server 2005, the mining model columns typically had the same name as the mining structure’s ones. There was no way in DMX to change the model column names (well, there is a way in BI DevStudio). Another problem: one would not include the email, name or phone number of a customer in a mining model, because, at best, this would increase training time and, in the worst case, would unnecessarily complicate the model with fake patterns. But this makes it hard to link the training cases leading to one pattern (available with the drillthrough feature) to information that would perhaps make that pattern actionable (like contact information, if the pattern suggest strong probability to buy a product). In 2008, these problems are much easier to solve, with mode column aliasing and structure columns drillthrough, and here is how these work. As Raman mentioned in the Data Miner newsletter, the November CTP of SQL Server 2008 is now available. 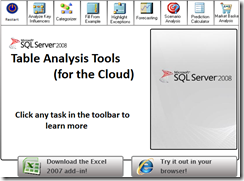 It includes many really cool new features in Analysis Services. Among them: Holdout support, Model filtering, DMX Column aliasing, Drillthrough enhancements, Cross validation and practically two new forecasting algorithms under the Microsoft_Time_Series umbrella. I intend to present all of them briefly, and I start today with the Holdout support. consist (typically) in evaluating model’s performance against data that was not seen during training (test data). The test data ideally has the same statistical properties as the training data (data seen by the mining model during training). An easy way to achieve statistical similarity between the training and test set is to use random sampling. This method is not guaranteed to give correct results (statistical similar populations) but, assuming that the random sampling mechanism is independent of the data, it will work in most common scenarios. SQL Server Integration Services has a Random Sample transform, which extracts a random sample (with a certain percentage) using a mechanism independent of the actual data being samples. This is why we strongly recommended using Integration Services to generate test/training partitions for SQL Server Data Mining. Now, there is a simpler way to do this. You may remember that, in the SQL Server Data mining architecture, a Mining Structure object acts as a data space while a mining model is a problem to be addressed in that data space. As the mining structure describes the data space, it is natural for the structure to partition the data into training and testing sets. In SQL Server 2008, the new wizard for creating a model (or structure — yes, there is a wizard now for creating a structure with no models!) allows specifying the desired size of the “Holdout” dataset — that is, data to be stored in the mining structure for testing purposes, without being available for models training. By default, the holdout size is 30% (leaving 70% for training). You may choose to specify a fixed number of rows instead of a percentage, or both (in this case the semantic is “use 30%, but no more than 10000 rows for test data”). The rest of this post shows how to express the holdout wizardry in DMX.